“The first trick is to mix three parts white vinegar and one part water in a spray bottle. Spray that on your windows at night before any frost has formed and you should be clear in the morning. You can also do the same thing with rubbing alcohol. Mix two parts rubbing alcohol with one part water and spray your windows the night before. This solution can also be used to melt ice that is already on the car, relieving you from any scraping. If you don’t have either of those items, experts say you can also try rubbing a half of an onion on your windows. Sounds weird, but they say it works. 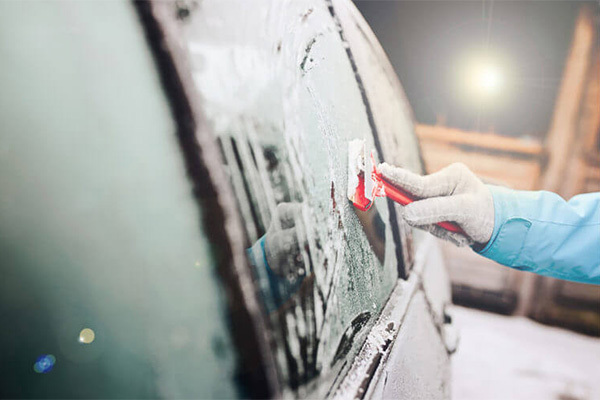 It can be extremely frustrating trying to chisel away ice on your windshield on those bitter-cold mornings. Chances are you don’t have the time or patience to do such a task before starting your work day. Now that winter is fast approaching, the above tips provide several options for preventing this headache. Although, we hope you don’t have to resort to using an onion to get the job done! Advantage Auto Glass offers expert windshield auto glass repair, replacement, and installation. Call us at 612-343-8984 or visit our website to view our services.